A U.S. helicopter crashed Sunday in southern Afghanistan, killing one crew member, the U.S. military said. The AH-64 Apache attack helicopter plunged to the ground shortly after taking off from Kandahar Air Field. A statement says one crew member was killed, while the other was injured and evacuated for emergency treatment. On Monday, a small explosion went off Monday in a classroom at a university in western Afghanistan, wounding eight female college students, police said. The blast took place in a women's English class at Herat University, said Nasar Ahmed Piakar, director of the criminal department of Herat police. Piakar said the explosive was hidden inside a trash can in the classroom. It did not contain shrapnel, he said. Eight young women were wounded, one of them seriously, he said. Also on Sunday an insurgent attack on a British base killed two soldiers and an Afghan interpreter, military officials said Sunday, while at least 20 militants died during clashes and coalition airstrikes. The deaths came amid a massive anti-Taliban campaign in southern Afghanistan involving more than 10,000 Afghan and coalition soldiers. It is the largest military offensive since the hard-line regime's ouster in late 2001. The two British soldiers died after their base was hit by small arms fire and rocket-propelled grenades Saturday night in southern Helmand province, said military spokesman Capt. Drew Gibson. An Afghan interpreter also was killed, coalition spokesman Maj. Quentin Innis said. Four other British soldiers were wounded but are in stable condition, he said. The military says the cause of the helicopter crash will be investigated, but that enemy fire has been ruled out. Officials say the helicopter was responding to a reported rocket attack against the airbase when it crashed. There were no injuries reported from the rocket attack. Two British soldiers were killed last week in an attack in the same district of Helmand province. A total of five British troops have been killed since the start of Operation Mountain Thrust. British Defense Secretary Des Browne mourned the deaths of the two soldiers and said Britain must be prepared for tough fighting ahead. "Our troops are in Afghanistan to help the Afghans rebuild their country. That means facing down the Taliban who will go to any lengths to oppose progress," he said. There has been a spike of violence in recent weeks as the NATO-led International Security Assistance Force prepares to take over security in southern Afghanistan from the U.S-led coalition. Coalition aircraft bombed a suspected Taliban hide-out in southern Helmand province, killing at least nine fighters including a Taliban area commander, Mullah Tur Jan, provincial Police Chief Ghulam Nabi Malakhail said. 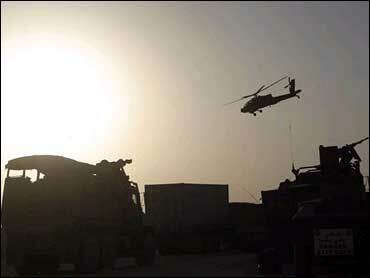 Innis confirmed the attacks, saying the coalition estimated that 12 to 15 insurgents were killed. In a separate incident in the same district, 11 militants were killed by Afghan forces Saturday night during search operations, said Helmand provincial police chief Ghulam Nabi Malakhail. He said Afghan forces came under fire from suspected militants and fired back, killing the 11 fighters. Since May, more than 600 Afghans, mostly militants, have been reported killed in Afghanistan, according to an Associated Press tally based on coalition and Afghan figures. The continued violence has stirred British lawmakers' fears that security is rapidly deteriorating in Afghanistan. Britain has some 3,300 troops involved in the current military operation. Militants are following the lead of insurgents in Iraq and carrying out suicide attacks and roadside bombings that once were rare in Afghanistan. "There are signs that the tactics that have brought such devastation to Iraq are being replicated in Afghanistan," the House of Commons Foreign Affairs Committee said in a report Sunday on the foreign policy aspects of the anti-terror fight.